Description: This incredible perfume was designed by Ernest Daltroff, who was co-proprietor with Felicie Vanpouille of Caron Paris. 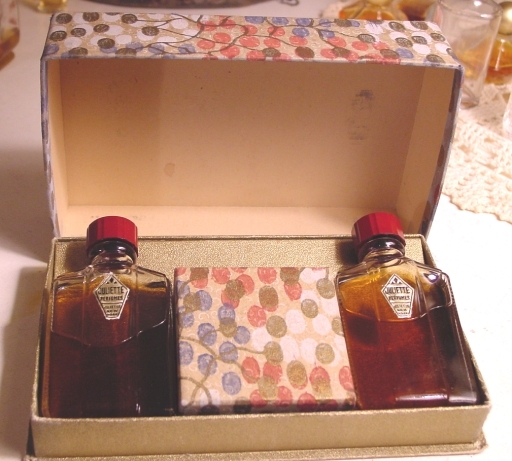 Before 1920s, manufacturers used the same bottles. But Caron wanted to create a bottle unique for this wonderful new perfume, so Vanpouille designed a bottle that would stand out from all the rest of the perfumes on the market. 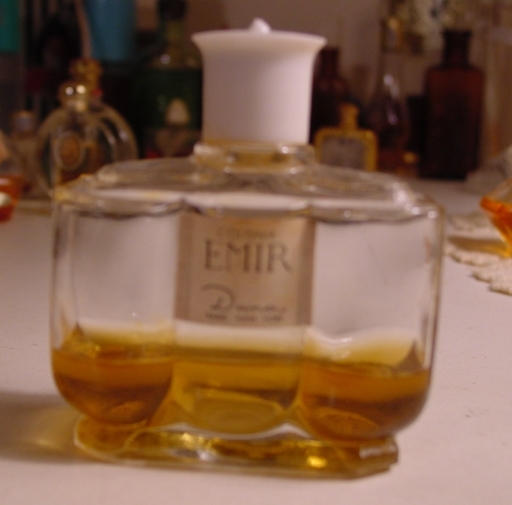 This perfume was such a raging success that not only did other pefumers copy the fragrance but they copied the bottle, as well. Caron immediately began to patent their bottles, and other companies followed suit. Caron was in the courts for years about copyright infringement on their designs. 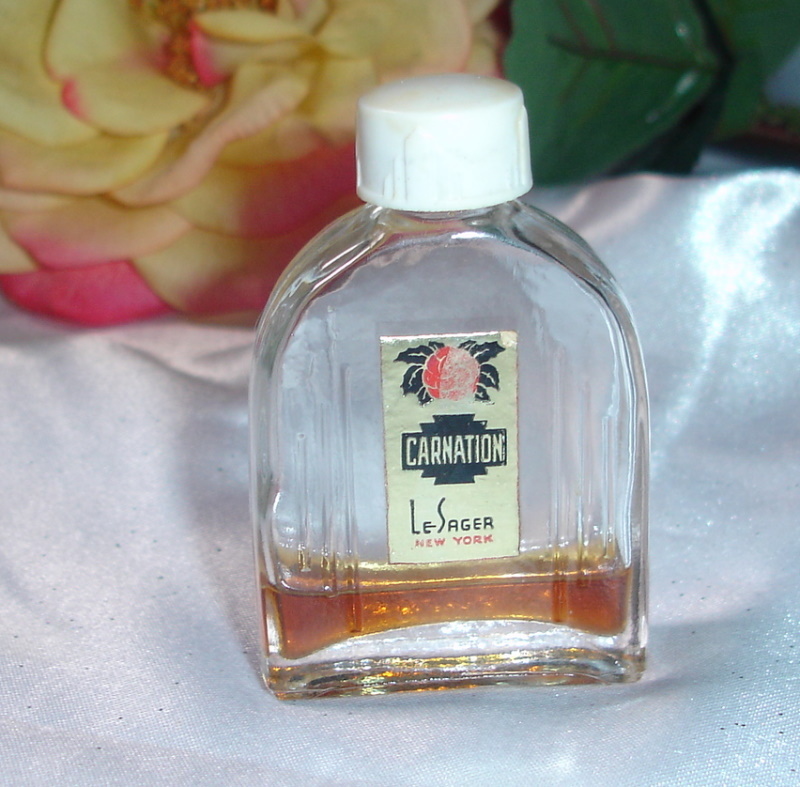 Caron was founded in 1903 by Ernest Daltroff. Fascinated by scent, he purchased a perfumery in Asinieres, near Paris, France. He also bought out a shop owned by Anna-Marie Caron and kept the name, thinking that it would sound better for the business . In 1904, Daltroff met a young dressmaker, Felicie Vanpouille. She became his lover and an active business partner, taking over the design and packaging of the Caron products. 1939 brought the threat of war and Daltroff, a Jew, left Paris for Canada. 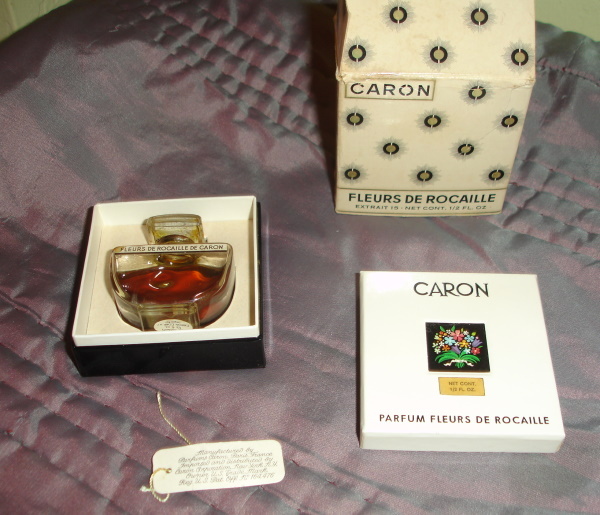 After Daltroff's death in 1941, Vanpouille became the sole owner of Caron. The fragrance was a blend of Orange blossom, bergamot, petitgrain, lemon, rose, jasmine, jonquil, Persian black narcissus, musk, civet, and sandalwood. And I have to say it is the best scent I have ever smelled. This is such a beauty, I hate to part with it. It stands about 1 3/4" tall and has no damage. 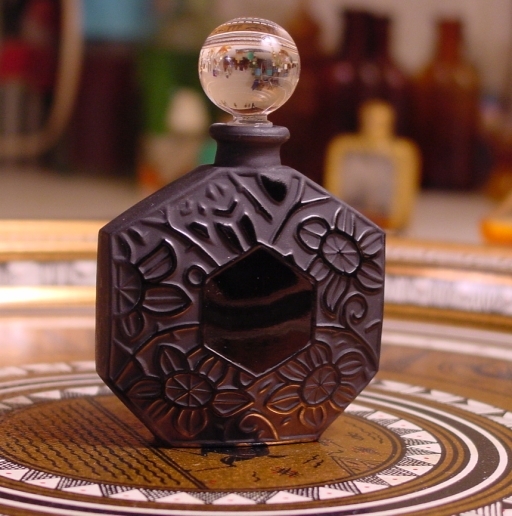 The bottle is glass and the stopper is black glass with a flower on top. 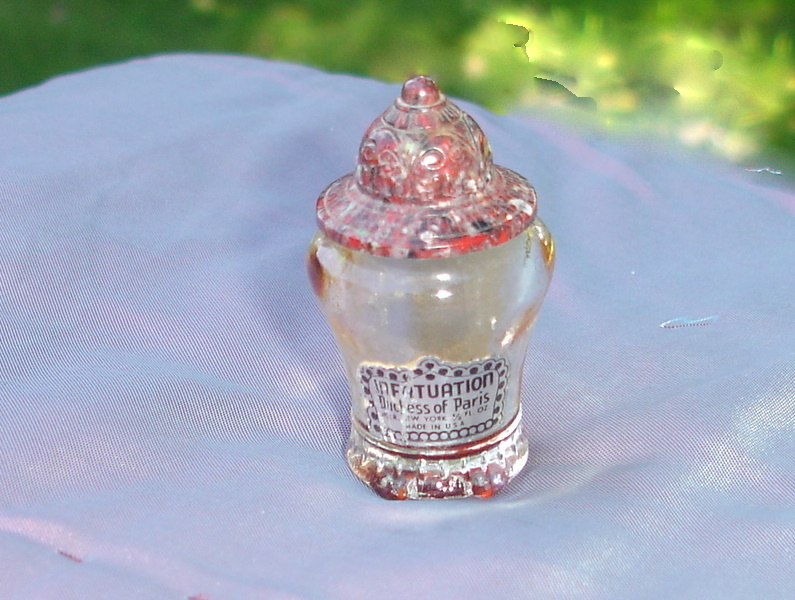 There is a string holding the stopper on the bottle, it is also in excellent condition and I believe may be original. The stopper is clean and the bottle is about 3/4 full. Someone took good care of this one, great addition to your collection! 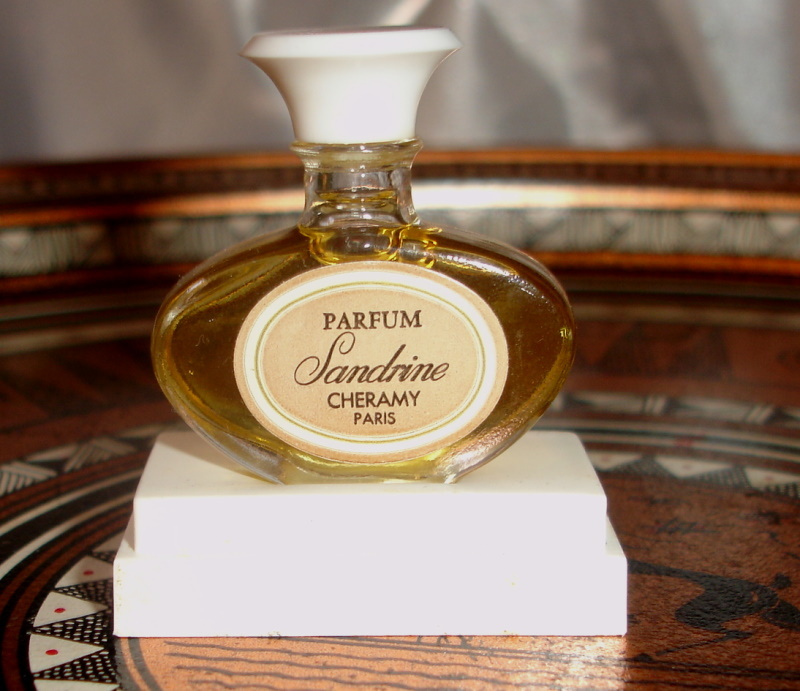 Description: Cheramy's first well known perfume was introduced in 1921 by Ramond Couin, called Cappi. The labels on bottles of Cappi products read Cappi and Cheramy New York. 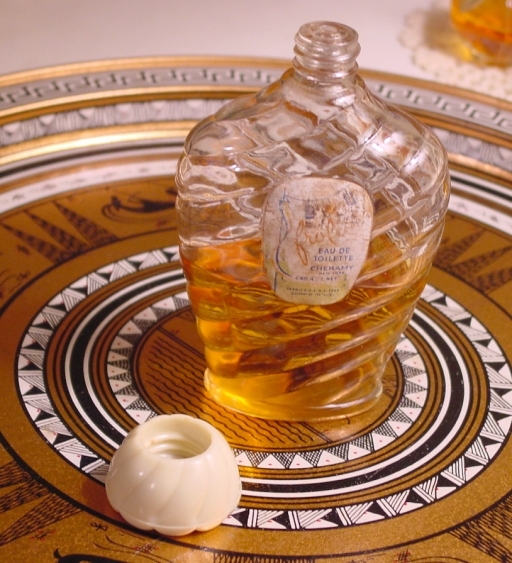 In 1922, Houbigant bought Cheramy made it a division to market its lower-priced products primarily to the US market. Bottles created in the 1930s list both New York and Paris on them. Cheramy New York. Permit S.D.A.N.Y. 2269, Comp'd in U.S. Cap. 4. oz Net. It is 4 1/2" tall and 2 3/4" at its widest point and 1 1/2" thick. It is a heavy gorgeous bottle with diagonal ribbing around the bottle and a complimentary cream colored bakelite cap that is also sturdy. Has Cheramy in raised lettering on the bottom of the bottle, and the number 1. I believe this may be a very rare bottle. The number 1 may indicate the first scent created and marketed after the merger. Or perhaps this was their first bakelite capped bottle after the glass manufacturers had installed the new bottling machines that allowed them to create bottles in one process with the outside screw threads on the bottles. It does have seams going down both sides of the entire bottle through the neck. But insead of having a flat top it has a top groove to the bottle. I have not seen this on another bottle. It is a quality machine made 1925-1929 heavy walled bottle. The label shows hanging paper laterns and just says "frolic". This seems to me to also reflect the era of the late 1920s. The thin paper label is dirty and a little faded. And does no justice to this beautiful bottle. But it is intact. Now the best part of this bottle is that when I found it is was sealed, with a silver lining on the bottle opening with most of the contents inside. Later when I went to show it to someone and unscrewed the top, the bottle hissed as I was opening it, and the silver foil stayed in the lid. Sigh. I guess I had tightened it too much. Now the foil comes on and off the lid, staying on the bottle. And the liquid appears to be evaporating. I won't open it again. Although it is very pleasant smelling and not as alcoholic smelling as other old Toilettes I have smelled. Description: Juliette perfume set that includes full talcum and two bottles of Narcissus perfume. Both bottles have the sticker Narcissus on the bottom. 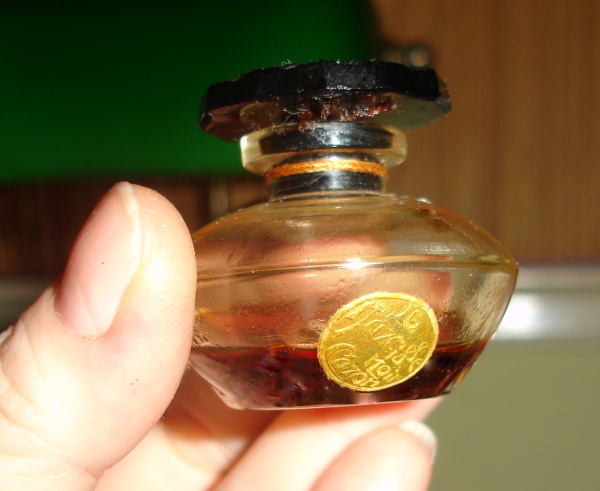 The bottles are a little over 3 1/4 inches tall and 1 3/4 inches wide. They have ribbed sides that are very unique and stylish. Early bakelite tops with cork for seal in cap. This is really an attractive set. And smells great. Description: Ombre Rose has been relaunched by its original creator Jean-Charles Brosseau, who regained the ownership rights to the name and fragrance from Groupe Inter Parfums, which had acquired the worldwide rights to the license from Alfin Inc. in 1993. 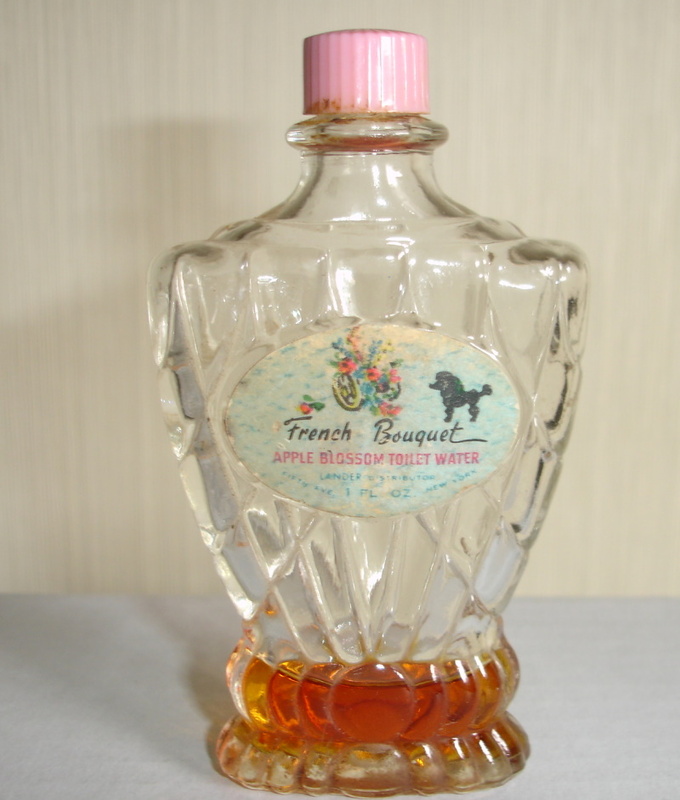 Brosseau had Givaudan rework the fragrance to return it to the original formula. It has been marketed as Ombre Rose L’Original in bottles that replicate the original Art Deco-style containers: black with shiny and matte patterns for the perfume, and clear or frosted glass for the eau de toilette. The bottle offered here is for the perfume Ombre Rose and the bottle is 3" tall. 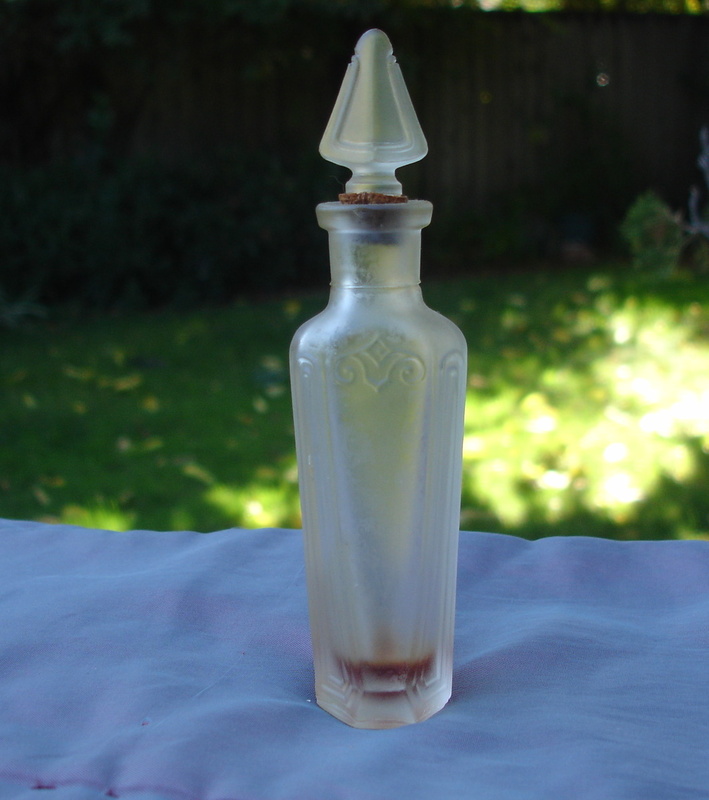 This is a large bottle, 6-1/2 inches high and 3-1/2" across. 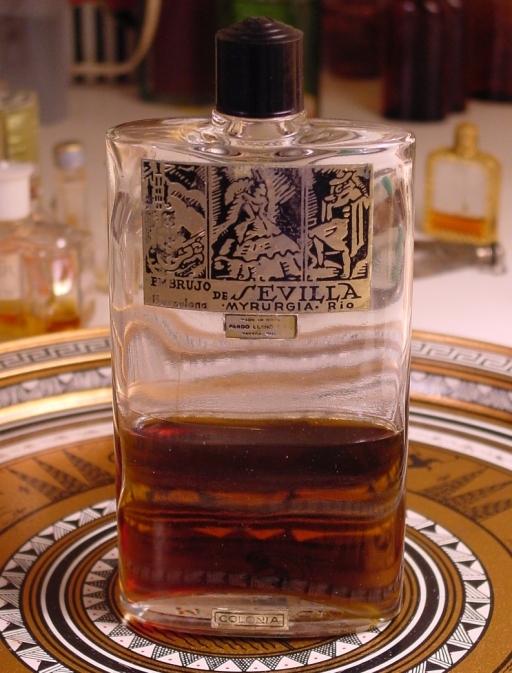 Beautiful gold and black label reading Embrujo de Sevilla (launched in 1933) and on the label, Barcelona and Rio. 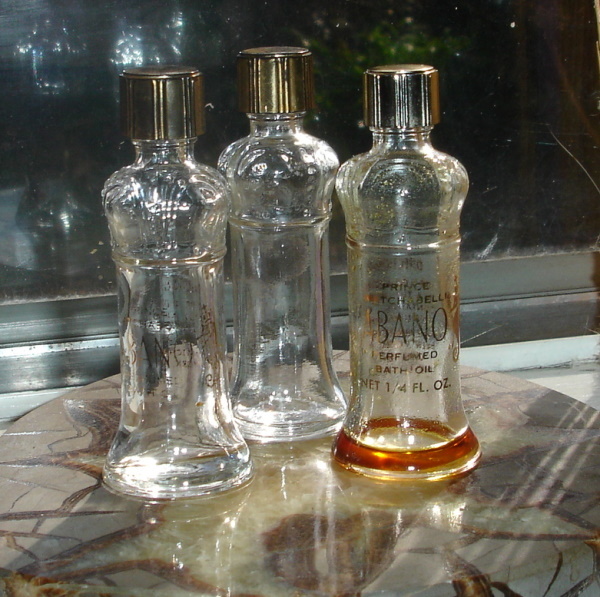 A smaller label says Made in Cuba, Pando Llano & Co. Havana, Cuba. The bottle has the Myrurgia name on the bottom as well. From a estate sale, right out of the bathroom which was literally piled high with vanity items, many of which were unopened and there for decades. This is probably circa 1940-1950 . Description: The Dana Parfums Corporation was founded by Javier Serra in Paris in 1932. Emir was released in 1936. It is a Chypre blend. And this bottle has aged well. It has a wonderful design and is pleasant to hold. The Plastic cap has a knobby point on top, it is actually nice. Label is aged but intact. Ad photo is from 1947. 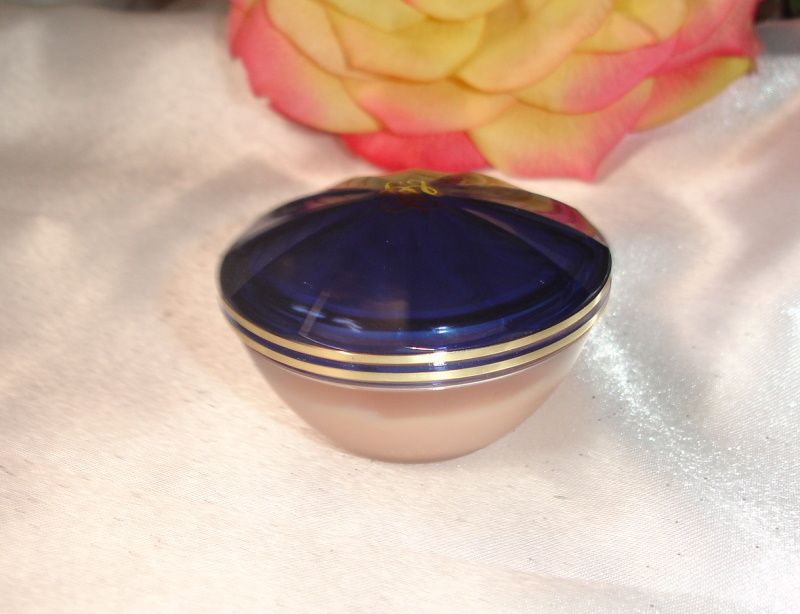 Description: Vintage L'Heure Bleue Bottle by Guerlain. Bottle is 3 1/4" with stopper and is approx 1/4 full. It is in perfect condition. Best smelling L'Heure Bleu I have smelled. Perfume is still very pleasant. A Great Collector Item! Description: The aroma is wonderful! Originally this bottle held 4 oz. There is a little gone, but the bottle is still nearly full! Distributed by A.A. Vantine New York, N.Y. Description: Vintage perfume and a rare one to add to your collection! 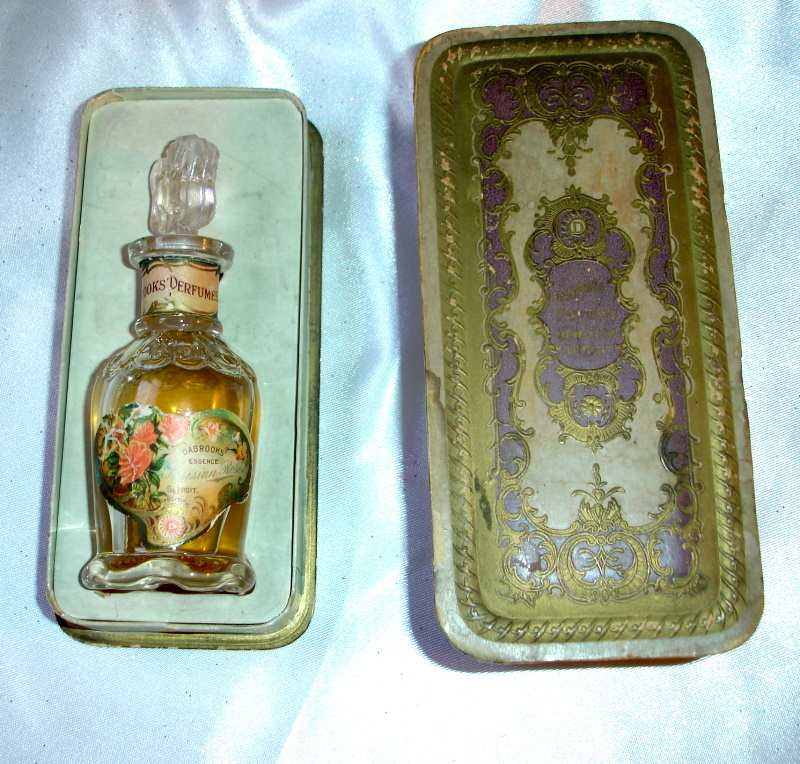 Bottle is 3.5" BY 2", and the bottom is embossed PARFUM DE RAUCH BOTTLE MADE IN FRANCE CONT. 1 FL OZ. Description: Bottles are 2" tall and each contain a different oil. One is Rose Celeste, another is Jasmin, and the last is Lavande. Great vintage condition. I think these are from the 1930-40s era. Box has staining appropriate for its age. See link for history of this perfume house, one of the oldest in the United States. Description: 1 7/8 inches tall, with a tortoise shell lid. Silver label is in great condition for its age. Most labels on these bottles are missing. This one is a little wrinkled but all there. Still has a drop or two of perfume in it. Description: This reminds me of an early Lander bottle. Very nice and in excellent condition. No nicks or chips or cracks. Cork has been replaced and is sealing well. Bottle is a little under 5" tall with stopper in bottle and is a two piece blown bottle in an octogon design with 5 sides, with scrolls and design in every side. Stopper matches the design of the bottle.Has a triangle on the bottom and the number 7. Description: This is an amazing find. 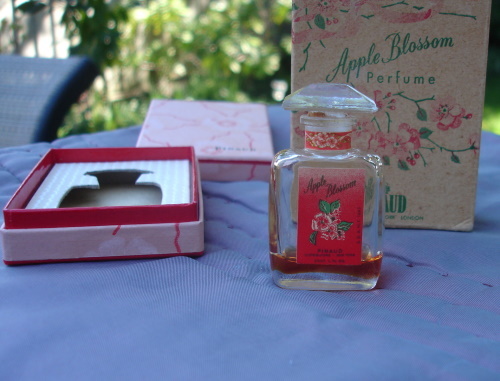 Apple Blossom perfume with the outer and inner boxes. Both boxes are pristine as well as the labels on the bottle. 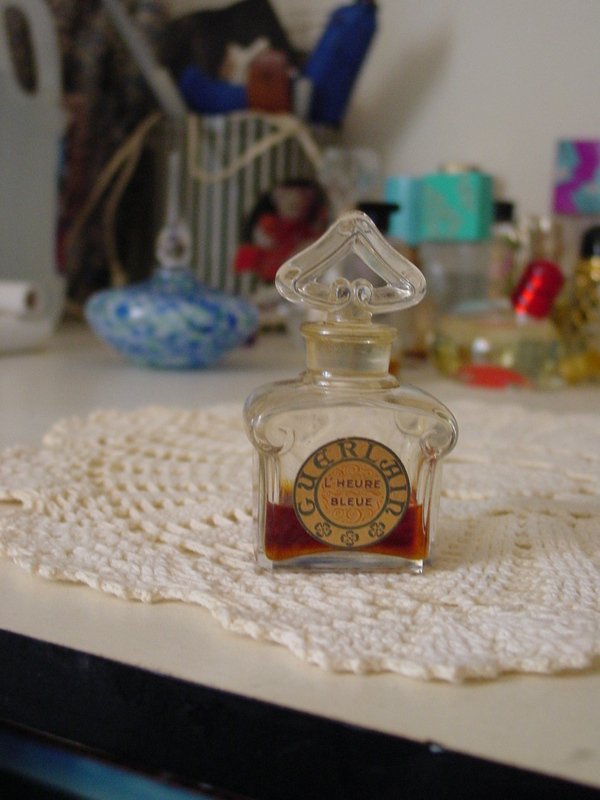 There is still a small amount of perfume left in bottle and it is wonderful smelling. Description: Great collector's item. A book that opens (it has a green satin ribbon that ties and holds together) and inside is a book "Scents of Time" Perfume from Ancient Egypt and the 21st Century. 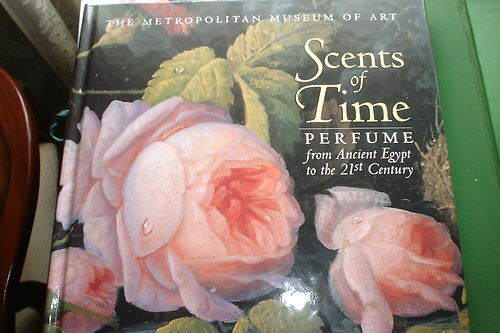 This book reveals perfume's widespread and permanent place in our culture of the senses, through illustrations, artefacts and paintings dating from 2000 BCE. The reader is guided through the ages through the bronze vessels of Babylon, kohl containers from Egypt, blown-glass amphorae from ancient Rome and the Islamic world, porcelain pot-pourris from the court of Louis XV of France, to the glass creations of Lalique in the 20th century. 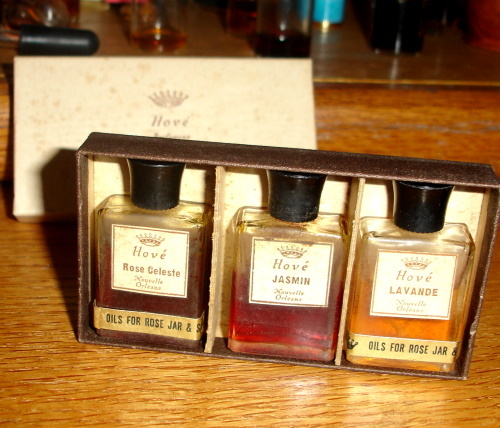 It also contains 8 bottles of perfume blended by the perfumers of Givaudan Roure. 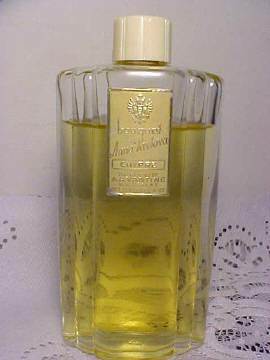 There is Frankincense, representing Egypt and the ancient near east, Rose, the favorite scent of the classical world, Sandlewood-Jasmine, a blend reflective of Islamic world and India, Orange Blossom, which originated in East Asia, Spice, a blend of aromatics emblematic of the Renaissance, Eau de Cologne, a refreshing fragrance first used in eighteenth-century Europe, Millefleurs, a floral blend with twentieth century aldehydic chemistry and Sportif, a fresh, citrus fragrance anticipating trends of the twenty first century. The book is 112 pages from fragrance historian Edwin Morris. The perfumes are pure extracts and smell wonderful. 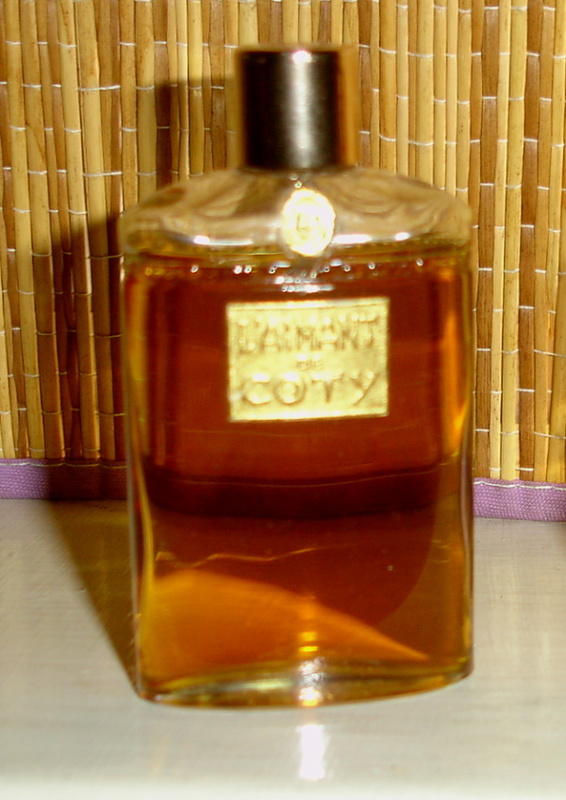 Description: L'Aimant De Coty perfume, created in 1927 by Vincent Roubert in collaboration with Francois Coty. L'Aimant, which means both "loving her" and "the magnet" in French. It has been said to have the following notes: aldhehydes, bergamot, neroli, peach, jasmine, rose and vanilla. It has also been described by different reviewers, after the strong aldehydes hit you, the scent becomes very creamy and buttery soft. As time goes by, it evolves from plummy apricot frutiness down to violets, jasmine, sandalwood and vanilla. This deco-style splash bottle measures approximately 3 1/4" Tall x 1 3/8" Wide. 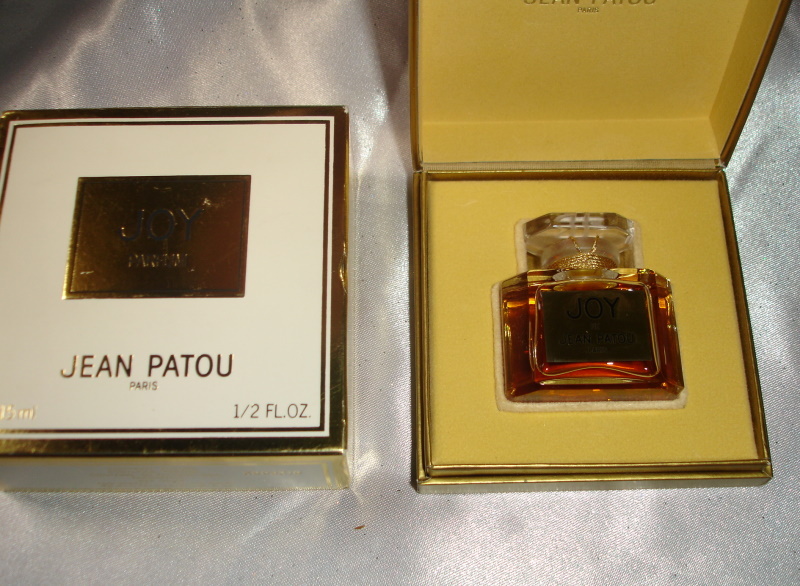 The label on the bottom of the bottle says "COTY New Yorks Paris Cont. 0.80 ozs." The glass on the bottom is molded "COTY 2 (inside a circle)". The bottle bottle is pre-owned, but is full. Any loss may be due to evaporation over the years. The bottle, labels and red cap are all in fantastic vintage condition. Description: Prince Matchabelli Abano Perfumed Bath Oil bottles with crown shoulders and vertically ribbed gold tone screw-off lids. Each is 1" in diameter at their base and stand 2-1/2" tall. Description: Vintage formula, smells wonderful. Outer box is aged and has some tears. Inner box is in good shape. Has about 1/3 of the original parfum. Description: First released in 1922 and now discontinued. It had a clear plastic cover over the base of the box, but I don't have the cover. I beleive this is from the early 1970s, although I saw that one sold on Worthpoint and the description said theirs was from the 1940s, and it looked exactly like mine, with the plastic cover. But since clear plastic wasn't used until the 1950s, their description seems like misinformation. Notes are Jasmine and Sandalwood. Really nice stuff in unused condition. Description: This is a wonderful perfume. Bottle is almost empty but the scent is perfect. 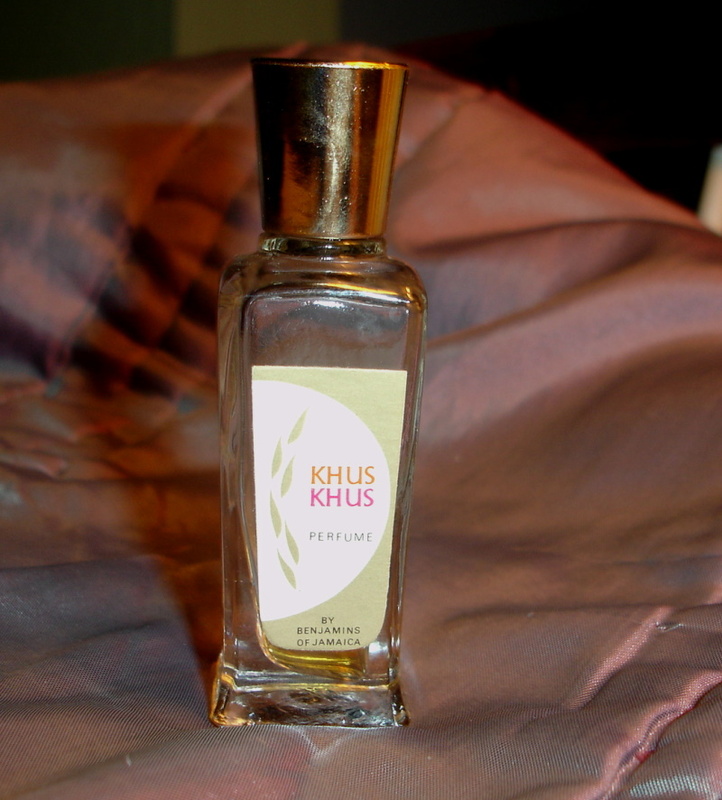 Great way to experience Khus Khus at a fraction of the cost of a full bottle. Description: This is a very cool bottle. It has its label around the neck stating it is Narcissus and the one on the back says Vivienne, Reg. Pat. Pending, New York Paris. 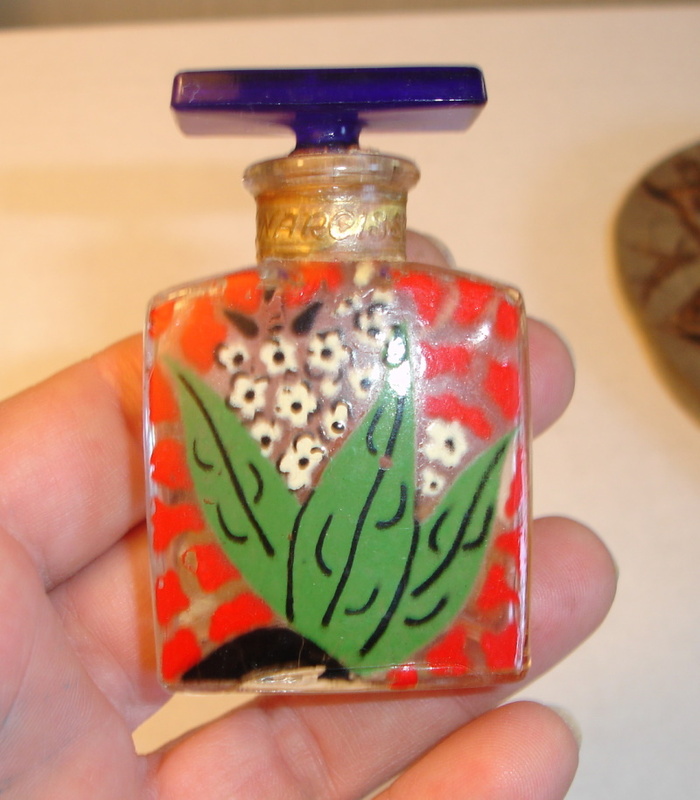 It has enamelled flowers on the front side, and the foil label with the name of the perfume on the back side. Has a blue stopper, that I don't know if is original or not. The size makes sense to the size of the bottle but the cork has been replaced and so it is not possible to authenticate if the blue colored stopper was part of he original design of the bottle. Sure looks great with the blue stopper. I don't recall seeing another blue stopper like this on any bottle. So the stopper alone is cool, and then the bottle is so unique. Great display piece as it pops out at you in a group of bottles. Real eyecatcher! Can't find any information about this company. I can date the bottle by the fact that it has an applied bottom from a 3 part mold, which was just coming into fashion from 1929 on. Probably also has an applied neck, which would make it a 4 part mold. 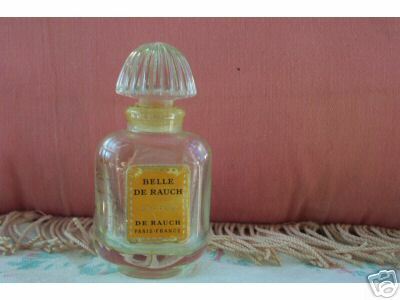 Description: I bought this new in the 1980s with the perfume. I love Shalimar. Container is half used but still smells wonderful. Container is plastic. Description: Beautiful art nouveau bottle and box in excellent condition. Bottle stopper is stuck and I have never tried to open it, although I have often thought about it. Dabrooks was a very successful perfume company in the early 1900s. No indication of size but I would guess 1.5 oz and there is more than half the perfume remaining. Description: Beautifully intricate bottle with a deep design. Bottle is 1 oz size and a small amount of the perfume remains, and it smells nice. Label is faded with age. Description: Foil label on this bottle is in fair condition for its age. Bottle is probably a 1/3 oz size. Nice Carnation scent, with about 1.5 ml left to enjoy. I had to keep some of this scent for my library. All photos on the Luv Parfum website are copyrighted. Downloading photos is a coyright violation.